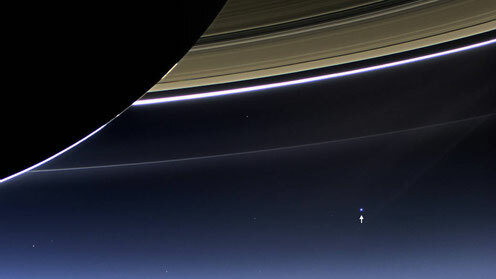 This photo - Earth from Saturn, captured by Cassini satellite. We`re all traveling together, some hand in hand, others pushing the hand away, on this living, vibrating mass of Earth, flying and spinning through space. We`re but a point in the vast sea of interstellar space. At the edge of our Solar System, we`re invisible to the naked eye. Our loving Home appears, almost, insignificant. We`re so tiny, yet our imagination is so great. With the spoken word, we can journey with others through the inner and outer Universe. When we speak, the Earth, whose elements we are made of, speaks. With our realization and expression of truth, the Earth too is illuminated. The stars, whose elements the Earth is made of, are in turn, expanded in consciousness. Therefore, when you speak with clarity and compassion, the Universe evolves. I really like this, Joseph.